Replacing oil tanks that are close to boundaries or buildings can be a bind. First there is the hassle of building protective walls and then the administration of certifying the installation for Building Control. Tuffa Tanks in conjunction with Association of Plumbing and Heating Contractors (APHC) has now made both parts of the task easier. The Tuffa FireStop tank can be installed in the same position as the old oil tank, as the tank incorporates its own fire protection. In addition APHC will approve the installation of this revolutionary new tank through its competent person’s scheme. The tank has been approved by Local Authority Building Control (LABC) and is built to comply with the relevant British Standard, giving installers and consumers peace of mind, with the added advantage of simpler installation and notification. It is considered unlikely that a fire will originate from the stored oil and it is the purpose of these recommendations, including Table 1, to ensure that a fire which may originate from a building or other external source is not transmitted to the tank contents or, if a fire occurred, its effects are limited. To meet the requirements of Part J of the Building Regulations in England and Wales, conventional oil storage tanks should be sited at least 1800mm away from non-fire rated buildings or structures, and 760mm away from non-fire rated boundaries such as wooden fences. The regulations state that if these requirements can not be met, then a fire rate barrier with at least 30 minutes protection should be provided. The Tuffa FireStop tank meets these requirements and can therefore be sited next to buildings, sheds and boundaries. The FireStop is an efficient and modern fire barrier system, designed for protecting the oil tank where fire protection is required. This approach has been tested and certified to give at least 30 and 60 minutes protection by Warrington Fire Research Centre. Ready factory fitted, quick and easy to install directly against the risk of FIRE. It is the only tank of its kind on the market! 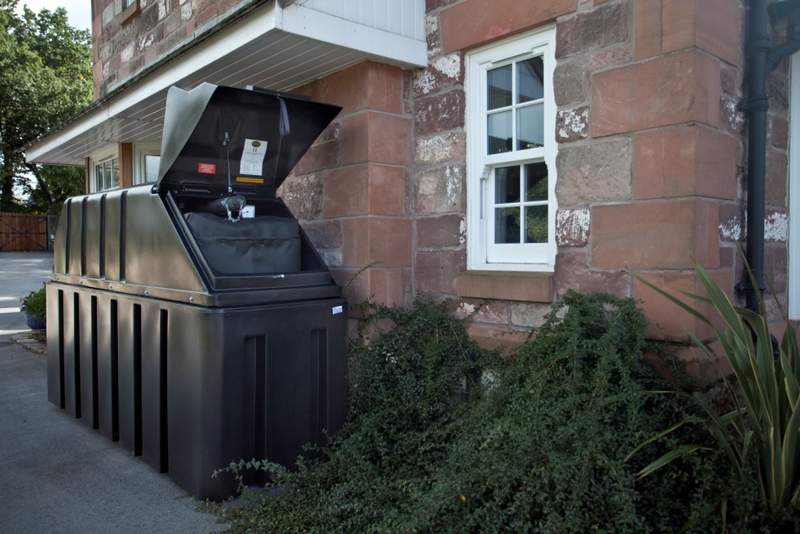 The tanks are available for domestic and non-domestic applications ranging in size from 1150 litres – 15000 litres and are available with either 30 or 60 minute Fire Protection. Steel Tanks can also be tailor-made in a size to suit a particular site with sizes from 900 litres up to 100,000 litres for non-domestic applications. “We are delighted that the installation benefits of the FireStop have been recognised by the Local Authority Building Control (LABC) so that the certification for Building control can now be done by the installer. “I have fitted several FireStop tanks and am very impressed. -Saves a lot of aggravation organizing a bricklayer and having to build a brick firewall. -Ideal for properties with limited space where it would be difficult to position an ordinary tank in order to comply with Building Regulations. – Ideal for fitting inside a building (no need to build a fire proof chamber). – Ideal for replacing old tanks in the same position that would not otherwise comply with Building Regulations.